Official: How do you say "Chrysler minivan" in Italian? "Lancia Voyager"
The Chrysler-Fiat merger has already spawned some nicely badge-engineered Chryslers for the U.K. market, and now comes payback. 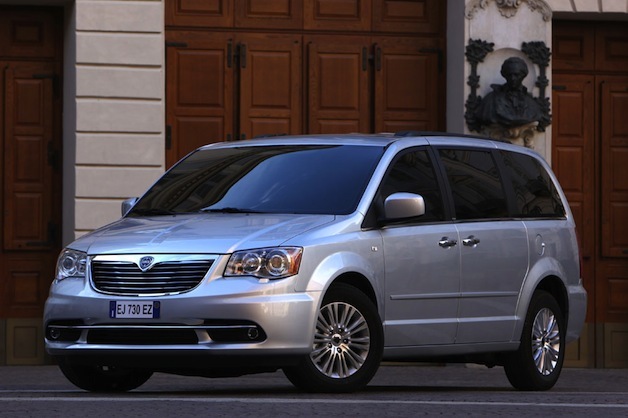 The 2012 Lancia Voyager goes on sale in Europe this month, and if it looks like a Chrysler Town & Country Limited, well, that's because it is. Save for some rather tastefully applied badging identifying the upscale Italian brand - and the removal of the TC's chrome bodyside molding - we're hard pressed to see much difference between the U.S. and Euro versions of the people mover, at least on the surface. Underhood, however, Lancia will be offering a 2.8-liter common rail turbodiesel that's unavailable in the States. While the diesel is only rated at a meager 163 horsepower, its 265 pound-feet of torque is more than the Pentastar V6 gasoline engine, which is also an option overseas. Fiat says the diesel Voyager is good for 30 miles per gallon in the European combined cycle; the 283-horsepower Pentastar manages just 22 mpg in this application. This would be the place where we would normally grumble about not getting the diesel version here in the U.S., but we're not going to do that this time. After all, it's just a Chrysler minivan. See the full press release after the break.Continue reading How do you say "Chrysler minivan" in Italian? "Lancia Voyager"
How do you say "Chrysler minivan" in Italian? "Lancia Voyager" originally appeared on Autoblog on Thu, 20 Oct 2011 16:00:00 EST. Please see our terms for use of feeds.